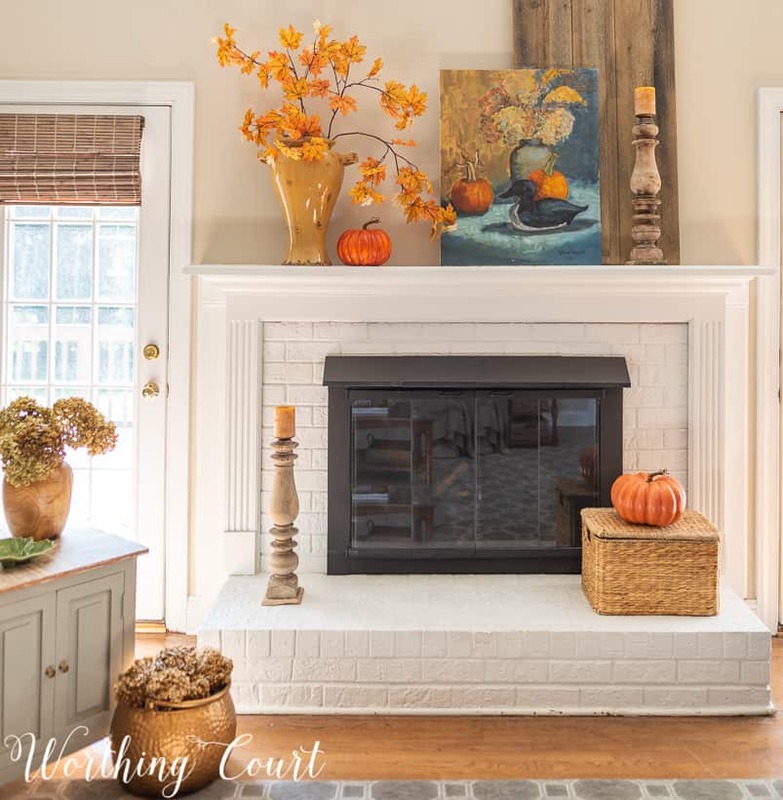 It has been all about keeping the fall decor simple at Worthing Court this year, so you’ll find my home filled with easy special touches for the season. I can’t wait to share it all with you, but today I’m excited to reveal my fall fireplace and mantel! 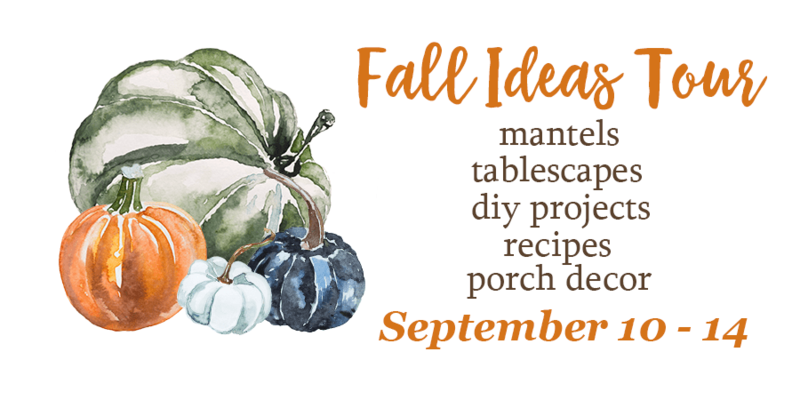 Welcome to the Fall Ideas Tour host by my friend Angie of Postcards From The Ridge and who also just happens to own the most wonderful online shop called Emory Valley Mercantile! I’m joining a group of bloggers who will be bringing you their very best fall decorating ideas all week – focusing on something different every day. You’ll find the schedule and all the links below. When I’m ready to do any type of seasonal or holiday decorating, I need inspiration. Sometimes that inspiration is easy to come by and other times I have to be patient and wait for it to come to me. This was one of those fall seasons that I had to be patient. I really didn’t know what I wanted to do until I was in my attic one day and happened to spot a painting, tucked way back behind a stack of other old artwork, that was done by my aunt back in 1984. You can see her signature and the year in the lower right corner of the painting. My aunt was a talented, avid painter and my whole family cherishes each one of her pieces. I love to mix traditional fall colors with my mostly neutral decor, so, I was drawn to the browns and golds of the hydrangeas and the rich russet orange of the pumpkins. The pretty shades of blue in the painting allowed me to tie in the blue/green hydrangea blossoms that I used in my foyer this year too. You can see that the hydrangeas in the painting inspired me to added them to other spots in the family room as well. I’m usually a person who craves symmetry, which keeps me in my comfort zone, but I also love the artfulness of an asymmetrical arrangement, when done well. The large crockery urn, on the left, balances the height and visual weight of the boards and painting on the right. I artfully arranged a few artificial leaf stems in the urn to add height and softness and to fill in some of the emptiness. 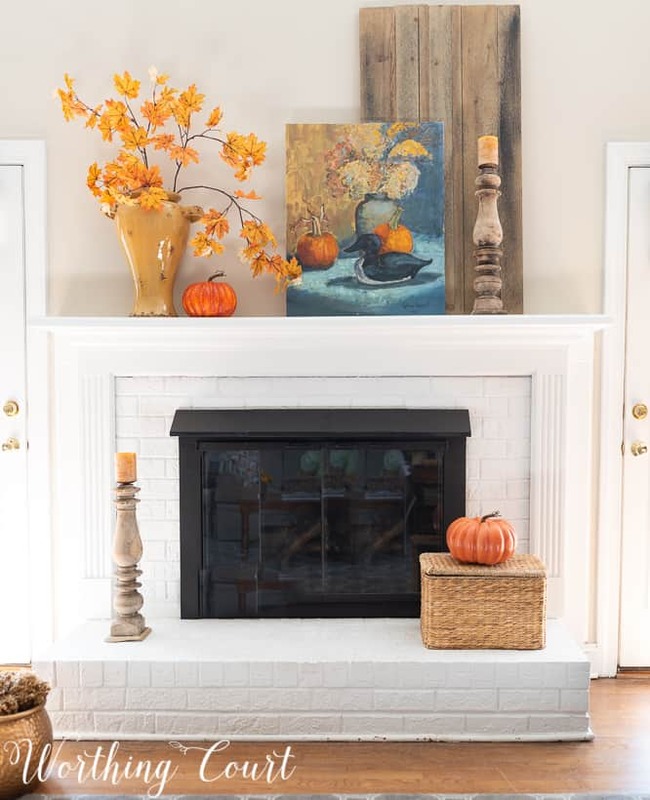 After adding my much adored candlesticks that I purchased during my trip to Magnolia Market earlier this year, I only needed to add a basket on the hearth and couple of pumpkins to finish this simple look. The nice thing about this entire arrangement is that nothing is actually hanging on the wall, The boards and the painting are simply leaning in place, so transitioning from fall to Christmas will be a snap! Thank you so much for stopping by for a visit at Worthing Court today. It would mean the world to me if you’d leave a comment to let me know about your visit! Enjoy the rest of the Fall Ideas Tour! What a treasure you have in that painting done by your aunt! It’s beautiful and looks perfect against your barnwood backdrop and with those lovely Magnolia Home candlesticks. Your face filled with fall foliage compliments the painting perfectly. I love what you created and I’m sure that any guest who visits your home will be drawn to your aunt’s painting. Thank you so much, Paula! I enjoyed being on this tour with you again this year! The understated look of the mantle is so refreshing. Each item is a statement of its own and the statement is fantastic. Oh my gosh Suzy! 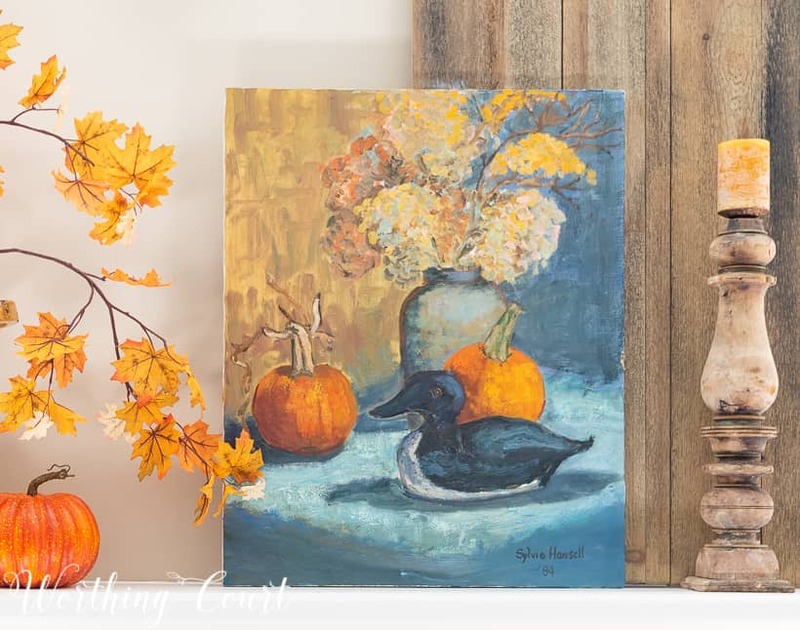 We love the painting and the entire story about your aunt and the inspiration for your mantel! It’s a great reminder to be patient…you never know never where your next bit of inspiration will come from. It can be so energizing too! Love your mantel. Thank you, ladies. Sometimes being patient while waiting for that inspiration to strike is so hard! I love that your mantel was inspired by such a meaningful piece of art! Thank you, Randi. I was so excited to run across the forgotten piece in my attic! THIS IS THE BEST! My favorite decorating piece out of all the others! The reason being is that is has history, a REAL connection to YOU, which is what decorating our homes should be more of! Not only that, I LOVE asymmetry! Makes it feel more natural and easy… not so “perfectly pretty”… THANK YOU! Can’t wait for fall!!! You’re too sweet, Cathy – thank you! Love, Love, Love! That painting is a treasure! I definitely love paintings of this nature. Love how you pulled everything together, and I like the change. My goal is to see if I can copy your idea and duplicate a similar vingette on my mantle which is very different from yours. You hit it out of the ballpark!! Thank you so much, Mary! Have fun with your mantel! This may be my favorite mantle of yours yet! Gorgeous!! I’m glad to hear that, Rebekah. I was a bit nervous about removing the large piece that was above it. Looks great, and isn’t nice to have a sentimental piece to be inspired by? Makes it all that more special. You’ll probably smile thinking about your aunt everytime you look at the painting this fall. You’re exactly right, Patti – I do! That painting is perfect. Your mantel looks great. Simple perfection. Suzy I love that painting!!!!! Thank you, Mary! It’s certainly a treasured piece. You achieved exactly what I’m going for this year. Simple, yet still keeping with the fall season. I guess I’m getting too old to be hauling out tons of fall decorations, only to pack them away within weeks to bring out the Christmas decorations. Simple, but elegant is my mantra this year. Love your mantle! Thank you, MaryJean. I’m like you – I’ve been hauling all those decorations out for years and it is certainly tiring. 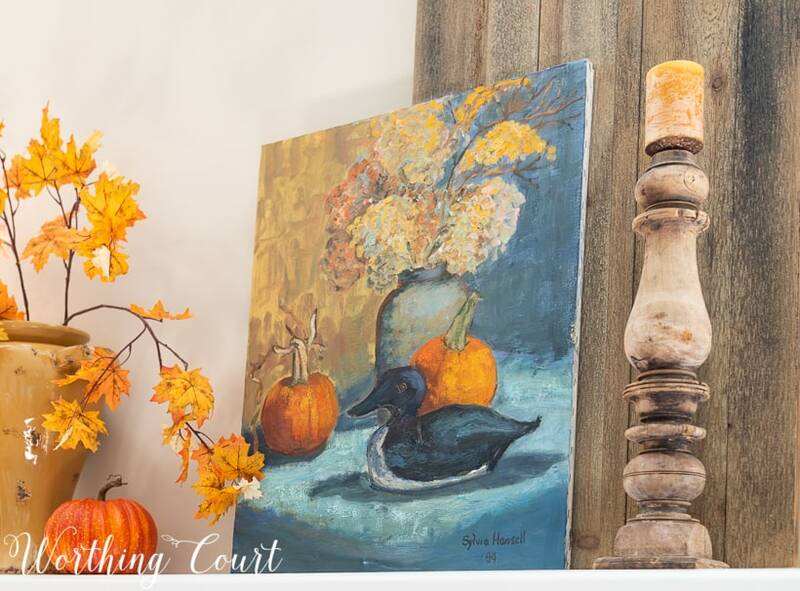 That painting is such a treasure, and I love how you incorporated it into your fall mantel! I really love your aunt’d painting! What a treasure. My family has several piece of hers and we all wish we had more! So beautiful!!! With how busy fall is, simple is ALWAYS a great choice! Love it! Thank you, Maryann. Yes – simple is best! Thank you, Angie. And thank you for putting the tour together again this year! Simply lovely, Suzy! The blues and greys from the painting go with the pops of orange perfectly. Would love to sit in front of this fireplace with a cup of coffee! I saw a hint of the painting in your last post and couldn’t wait to see the rest. So great and the sentiment even better, although I was hoping it was something we all could buy a copy of! Also like the new boards and just the simple elegance of the whole mantle. Love Fall! I love inspiring everyone and that’s the hard part about using original pieces – I don’t have a resource for others to buy one too! Love this! The picture just ties everything together. Thank you! It has been the inspiration for all of the fall decorating around my house this year. Your mantel is truly gorgeous! Love the way you took the colors of the beautiful painting and built the whole scene with it. I love the painting done by your aunt! How nice that you have that to remember her. I was really surprised to see you took your arched metal artwork down. I really like that piece, too, but I understand the need for a change though. It was hard for me to take that large piece down, but now that it’s gone, I’m glad that I did. Now to figure out what to put up there after fall and Christmas! Yes Yes Yes! Love your moves towards less and simplicity. Looks so elegant and peaceful. Thank you, Deb! I tried to make simplicity my friend this year. Love the simple look of your mantel this year, Suzy. That painting is a stunner. Your aunt was very talented. I know you must cherish her artwork. I love the paintings my grandma did. what a beautiful treasure that painting is, I love all the colors, it’a just gorgeous! 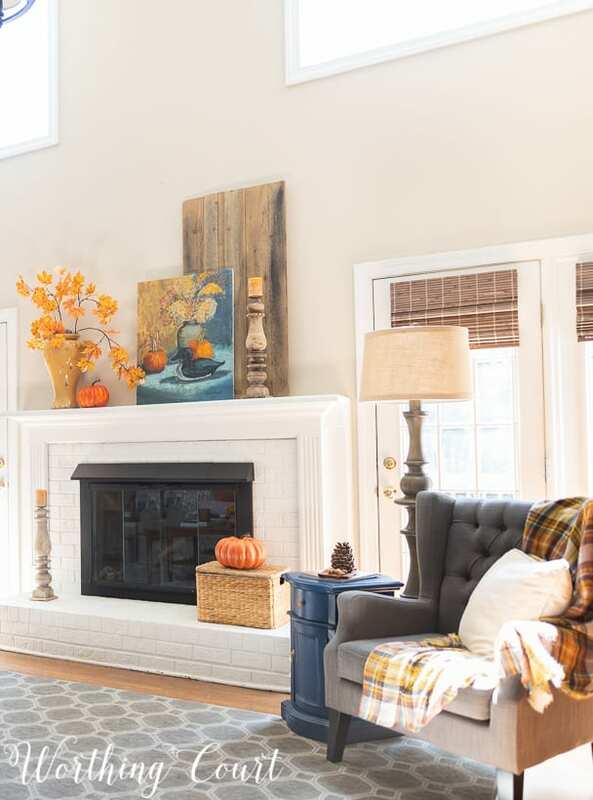 I love everything about your mantel for the coming fall season. The still life is simply gorgeous, and the leaves/branches in the vase are just an elegant touch for our autumnal beauty. 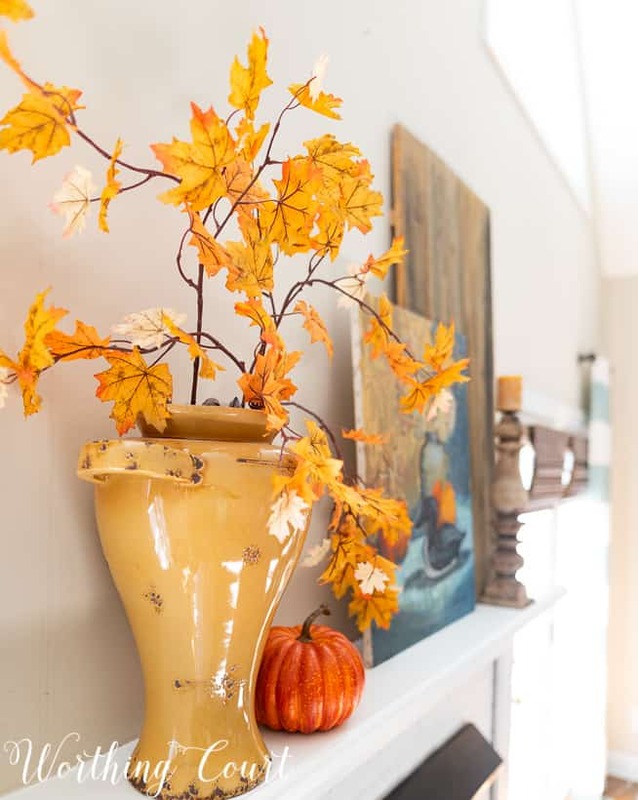 You have just enough color in front (and on) the mantel to draw one’s eye right to our fall celebrations! Love the tall candle holder too. Thank you so much, Barbara. Glad you like everything! Suzi, your mantel is so pretty. I love how you kept the decorations simple and how everything coordinates so perfectly! Suzi, your mantel is just stunning. I love the blues and the orange, and how great to find inspiration in that painting! Thank you, Susan. I was pretty tickled when I ran across it in my stash. First off…how lucky are you that you had that fantastic painting done by your aunt in your attic? Not everyone can say that! And I LOVE the leaves with that painting! Your ‘asymmetry’ speaks to me…I think I live my life a bit off-center. 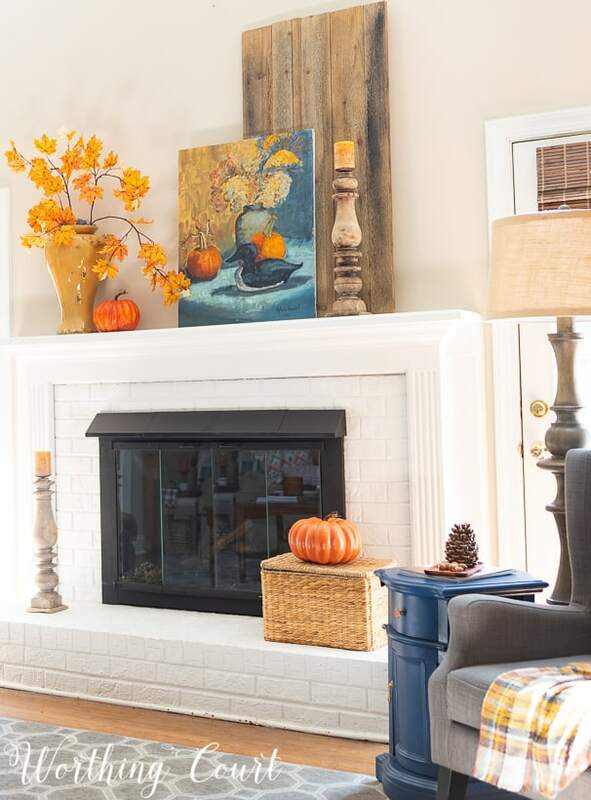 I haven’t had the opportunity to do some fall decorating yet…but your beautiful mantle is encouraging me to get busy. Thanks for the lovely eye candy. Haha! Love your comment about living your life a bit off-center. I’m right there with ya! Your mantel looks beautiful, Suzy. I love the classic elegance and the color scheme….warm and welcoming. I love your asymmetrical mantel, I struggle to do symmetry in my decor so this one speaks to me… It’s so beautiful and elegant! Thanks, Laurie! I think this is the very first time I’ve ever been happy with my attempt at an asymmetrical arrangement. I love this look! Thanks for the inspiration, I’m going to try a similar look on my mantel. So happy you found some inspiration, Michelle!